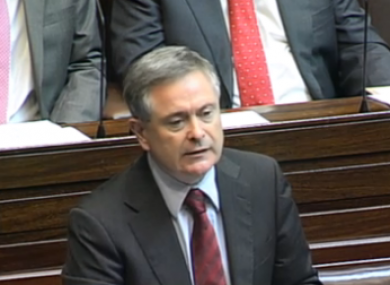 THE PUBLIC EXPENDITURE minister Brendan Howlin has affirmed that the government does not plan to defer increments due to lower-paid public servants – potentially re-opening conflict between the government parties. Taking Leaders’ Questions in the Dáil this morning, standing in for Eamon Gilmore, Howlin said previous Labour Court rulings had affirmed that increments – the annual pay increases given to public staff in lower wage brackets – were a core part of employees’ pay. While Howlin said the government was keen to lessen its overall spending on the public payroll, it had sought to do so by introducing caps on the wages of higher-paid servants in the public and semi-state sectors. “So long as Croke Park and the unions signed up to it deliver their side of the bargain, the government is committed to delivering its side,” the minister affirmed to Sinn Féin’s Mary Lou McDonald. Howlin admitted that he was “anxious to negotiate and interact with the trade union movement – as I do all the time – to get the best value”. The minister said he was a “strong supporter” of the deal and referred to recent reports showing that the deal had achieved savings of about €1.5 billion since its introduction two years ago. Under the deal, the government commits not to enforce compulsory redundancies in the public sector, in exchange for commitments from staff on extra flexibility. The prospect of increments being withheld arose at the weekend after transport minister Leo Varadkar pointed out that suspending increments could save in the region of €200 million a year. “I certainly wouldn’t begrudge anyone their increment but its very hard to justify giving anyone a pay increase in the year ahead while we’re cutting services,” Varadkar had told Newstalk radio. Varadkar’s figure has been questioned, however, with Labour chairman Colm Keaveney suggesting that the savings would actually be closer to €50 million. McDonald had also taken issue with the “scandalous” €238,727 salary being paid to the new chief executive of the VHI, John O’Dwyer – which was yesterday reported to be in breach of the pay cap set by the government for semi-state staff. Howlin said there were occasional situations where “to get people of the skills necessary to do some of the jobs we need to do”, the government needed to show “flexibility” in the wages being offered to chief executives. The cabinet had previously indicated that only the chief executive of ESB would be permitted to earn more than €250,000 a year, while only the chief executives of RTÉ, An Post, CIE and the Dublin Airport Authority would be given wages of over €200,000. Howlin has previously explained that the VHI wage was sanctioned following presentations by the Minister for Health, James Reilly, and this morning said he had not sanctioned any wage above the €250,000 upper ceiling laid out when the government took office. Email “Howlin insists: If Unions keep Croke Park commitments, we’ll keep ours”. Feedback on “Howlin insists: If Unions keep Croke Park commitments, we’ll keep ours”.